The next meeting of the Ulysses Reading Group is on the 2nd of December at 7.30pm in Muir Court. We are continuing where we left off in the Circe episode at the line: From left upper entrance with two gliding steps Henry Flower comes forward to left front centre. In this section we hear the voice of a waterfall. 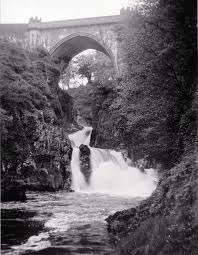 The waterfall in question is on the River Liffey at Poulaphouca in County Wicklow.